Irish free-to-air television users can now benefit from the launch of a new hybrid service that combines terrestrial, satellite and on-demand TV. Soarview, Ireland's digital terrestrial television service, has launched Soarview Connect, which is the result of a collaboration with Freesat and its EPG system Metaphor. The first box supporting the service is going on sale at leading Irish electrical retailers this week. Existing Soarview users can upgrade by purchasing one of the new boxes. Via the new EPG, users of the service can see what's on now, next or catch-up on programmes via on-demand (where available). The service offers a selection of weekly TV highlights and allows a search of the last or next 7 day listings to find a programme. The EPG is available in English and Irish. A new universal remote control and mobile app provide users with additional control - although some functions such as remote record, won't be added until mid-2018. 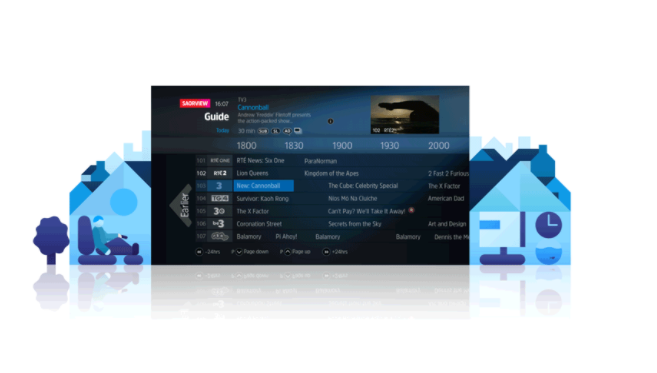 To use the service, viewers in Ireland in coverage of the Saorview digital TV service need a TV aerial for access to the normal Irish free-to-air channels, plus a broadband internet connection for the on-demand services, such as the RTÉ Player. Additionally, the first Saorview Connect product going on sale this week also includes a free-to-air satellite tuner. This optional extra allows those users with a satellite dish pointed at the Astra 2 satellites at 28.2E to gain access to additional channels, mostly from the UK. However, reception of Irish channels such as RTÉ and TG4 is solely via terrestrial aerial, not via the satellite dish. An upgrade to allow users of Saorview Connect to record to an external USB Hard Drive is due to take place in summer 2018. The Saorview website contains more information for end users.